In January, the National Enquirer published text messages between Bezos and Lauren Sanchez detailing the affair, not so long after Bezos announced a divorce from his wife, MacKenzie Bezos. 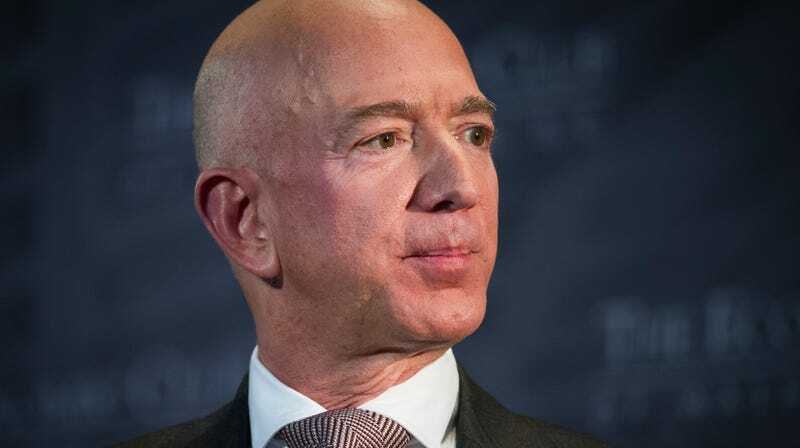 Bezos has since accused the tabloid and its parent company American Media Inc. (AMI) of extortion and blackmail for threatening to publish unreleased, intimate photos of him and Lauren Sanchez presumably leaked alongside the texts unless he released a statement absolving the Enquirer, which is sycophantically pro-Donald Trump, of any political motives in the matter. CNN is the third publication to release a report implicating Michael Sanchez in some role regarding the leak of the text messages. Previously, multiple sources inside AMI, as well as another “in extensive communication with senior leaders” at the company, told the Daily Beast that the brother had provided the texts to the Enquirer. On Tuesday, the Associated Press reported that investigators working for Bezos had similarly concluded that Michael Sanchez was the source of the messages. The CNN report does not explicitly confirm that Michael Sanchez was the one who obtained the texts (or as-of-yet unpublished photos), just that he was the one who tipped the National Enquirer off to the affair. But there is ample reason for suspicion. Trump frequently fires off enraged rants about Bezos, who also owns the Washington Post. In the president’s mind, “Jeff Bozo” is a nefarious schemer whose paper is totally beholden to Bezos’s business interests. Michael Sanchez is a “pro-Trump Hollywood talent manager who is also an acquaintance of provocative Trump backers Roger Stone and Carter Page,” per the Post, and frequently tweets about “fake news” conspiring to harm the president’s reputation. On Wednesday, the Daily Beast separately reported that Michael Sanchez had leaked embarrassing details about other clients to AMI and its gossip properties. There is vague evidence to the contrary, such as it is. The New York Post, another nefarious tabloid, alleged “sources” said Lauren Sanchez had shown or forwarded the pics to friends—though said sources appeared to be speculating. The National Enquirer has reportedly acted as a fixer of sorts for Trump in the past, buying the rights to embarrassing stories about him and then not publishing them. AMI’s chairman and CEO, David Pecker, received immunity from federal prosecutors in August 2018 for testimony about the president’s knowledge of payments Trump’s former attorney (and soon-to-be jailbird) Michael Cohen made to women who said they had affairs with Trump. As the CNN report noted, Bezos implied when accusing the National Enquirer of extortion that Trump—or, bizarrely, the Saudi government—was involved in the decision to pursue and publish his text messages. Nothing showing that has come to light. And while the National Enquirer and Michael Sanchez appear to have robust sympathies towards the president, it’s still possible that this was all about a juicy scoop concerning the dalliances of the richest man in the world, rather than currying favor or embarrassing one of the president’s enemies. Per CNN, Michael Sanchez denied leaking the texts and bizarrely claimed that Bezos’s own investigators had cleared him in a statement that came before CNN reported that he was the National Enquirer’s source. “I have been told that the Amazon investigation determined that I was not involved in the leak of the d*ck pics, because I never had access to any of the d*ck pics,” Sanchez told CNN. On Wednesday, CNN reported, he declined to comment on the record.